India has yet again on Saturday snubbed Pakistan Prime Minister Imran Khan for his comments on minorities in India and said authorities in Islamabad will do well to focus on its 'domestic challenges' and improve conditions of its citizens rather than try and 'divert attention'. 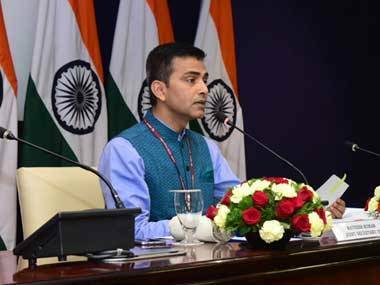 In response to media queries on remarks made by Pak PM, the MEA spokesman Raveesh Kumar said: "The Pakistan Prime Minister’s remarks are an egregious insult to all citizens of India". "Pakistan’s Prime Minister has yet again demonstrated his lack of understanding about India’s secular polity and ethos," he said adding the cricket star-turned politician only "overlooks the obvious fact that adherents of all faiths choose to live under the democratic polity and the progressive Constitution of India". "India has eminent leaders of all faiths who occupy its highest Constitutional and official positions. In contrast, Pakistani citizens of non-Islamic faith are barred from occupying high Constitutional offices.The minorities are often turned away from government bodies like the Economic Advisory Council of their Prime Minister, even in ‘naya Pakistan'," he said taking a pot shot at Mr Imran Khan's much touted slogan about his government. "Pakistan would do well to focus on its domestic challenges and improve conditions of its citizens rather than try and divert attention. The Pakistan Prime Minister’s latest attempts to play with minority sentiment in India will be rejected by the people of India," MEA spokesman said. The strong words from MEA spokesman came in reference to media reports wherein Imran Khan has been quoted as saying that his government "would not allow minorities to be treated like second class citizens like those experienced by minorities in India”.